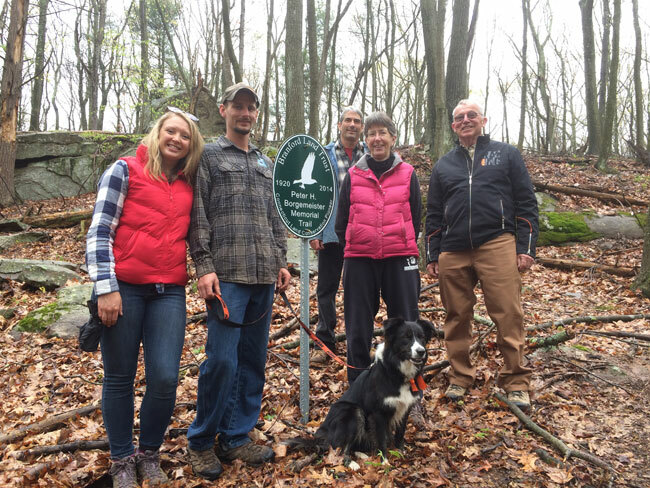 The Branford Land Trust is pleased to announce the dedication of the Peter H. Borgemeister Memorial Trail, located in the Hoadley Creek Preserve on the eastern side of Branford. Peter was a leader in woodland and wetlands conservation who was instrumental in the preservation of Beacon Hill and several parcels that make up the Hoadley Creek Preserve. He was a longtime member of the BLT and served as its President from 1994 – 1997. He is remembered by members and volunteers for his passion for the environment, and for his unique ability to bring people together to work toward the common goal of protecting our natural resources. The dedicated trail was a particular favorite of Peter’s because of its impressive collection of huge glacial erratics. To hike the Peter H. Borgemeister Memorial Trail, park at the Hoadley Creek Preserve trailhead near the railroad overpass on Route 146, and hike north to the field, where you’ll see one of the new trail signs designed by Peter’s son Alex. Click here for a Hoadley Creek Preserve trail map. Members of Peter’s family joined the BLT for a hike and trail dedication on May 7. Pictured (left to right): Holly White, grandson Peter Walck, son Alex Borgemeister, daughter Alison Walck, Robert Walck and Hairy the dog. • Click here for more photos from the dedication.